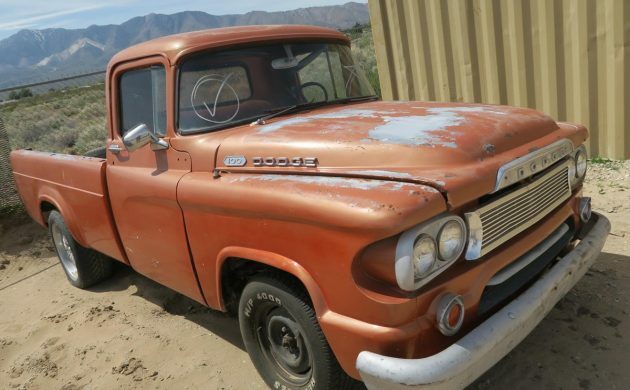 1960 was a transition year for Dodge pickups and this 1960 Dodge D100 would be a relatively inexpensive way to get one of the last of this style pickups. This example is listed here on eBay as a classified ad in Lucerne Valley, California with a price of $2,500. This truck has been parked since 1990 and I’m hoping that it hasn’t been sitting outside for 29 years, but there isn’t a mention of where it has been parked. You can see sun damage on the paint but it also looks shiny as if it has been restored at some point. In trying to decode the VIN, I’m coming up with this truck being a 1961 1/2-ton D100 with a V8, but that can’t be right. The first number is a 1 which = 1961, the second number is a 1 which = 1/2-ton, the third number is an 8 which = a V8. 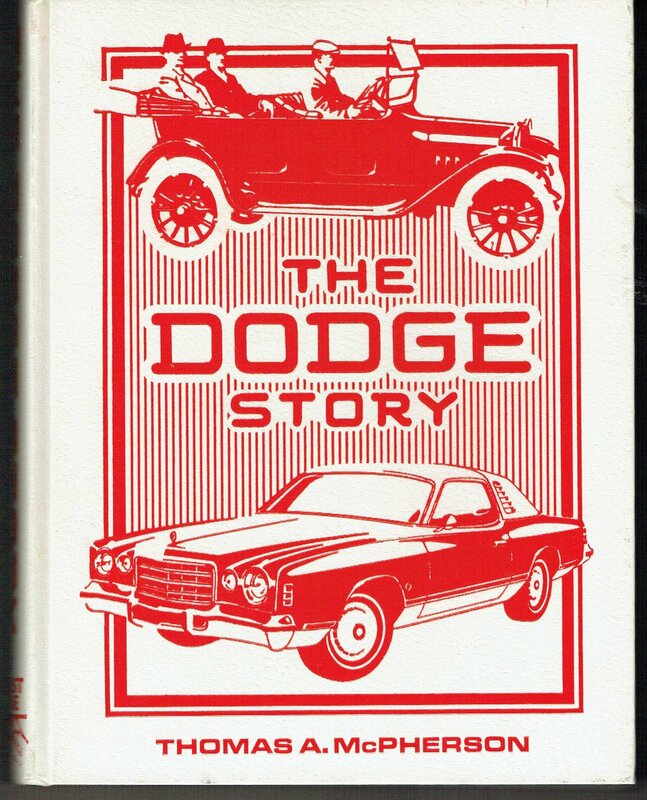 Even my Dodge bible (The Dodge Story) shows this truck as being a 1960 model with that unique grille and there are a boatload of photos on the internet showing this truck as being a 1960 model. Can anyone dig up a good VIN decoder for a 1960 Dodge D100? I don’t know for sure and I hesitate to spread fake news, but this truck appears to have been restored to some point, at some point in its history? 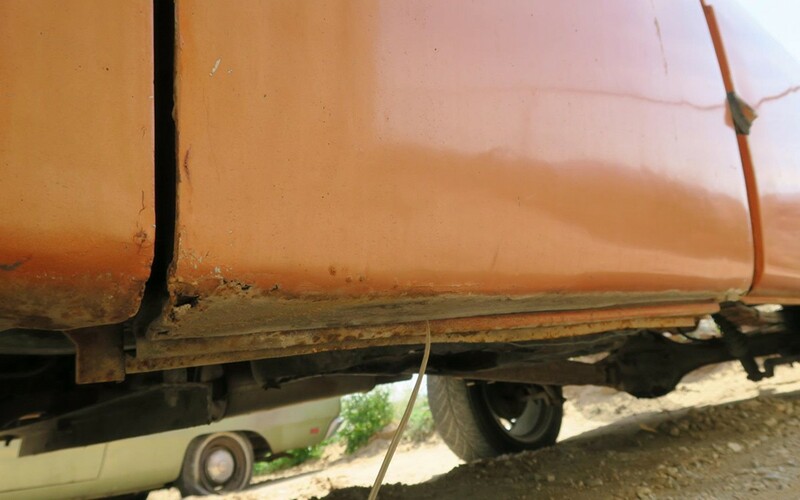 The seller has included a lot of photos which is great, even a lot of underside photos and some showing what appears to be some bodywork under the paint? I could be wrong. Dodge offered a couple of trim levels and this appears to be a standard model with no chrome side trim as the Deluxe would have had. This truck has a somewhat fancy interior for being the last of the old-generation pickups for Dodge. Was AC available in a 1960 Dodge pickup? Maybe so but I remember our 1969 Ford pickup being somewhat of a novelty with factory AC. You can see some rust in a few places such as the sill-steps. Almost anything is fixable but I’d want to check out this one in person if possible. The VIN shows this truck as having a synchronized 4-speed but it definitely looks like an automatic floor shifter on the hump? This is a confusing truck. 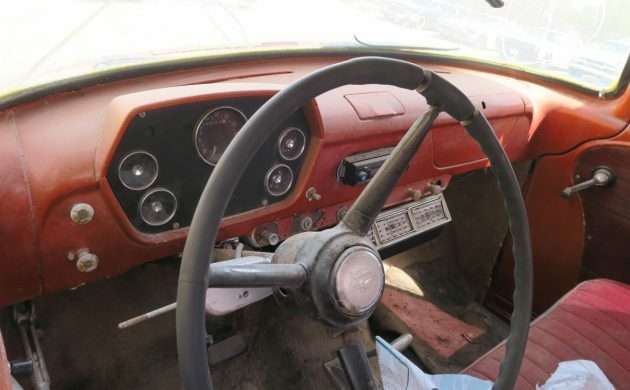 For even more confusion, this is most definitely not a 230 flathead-six which is listed as being in 1960 Dodge trucks, even on the Allpar site. I believe that this is a 225 slant-six but I don’t know for sure. 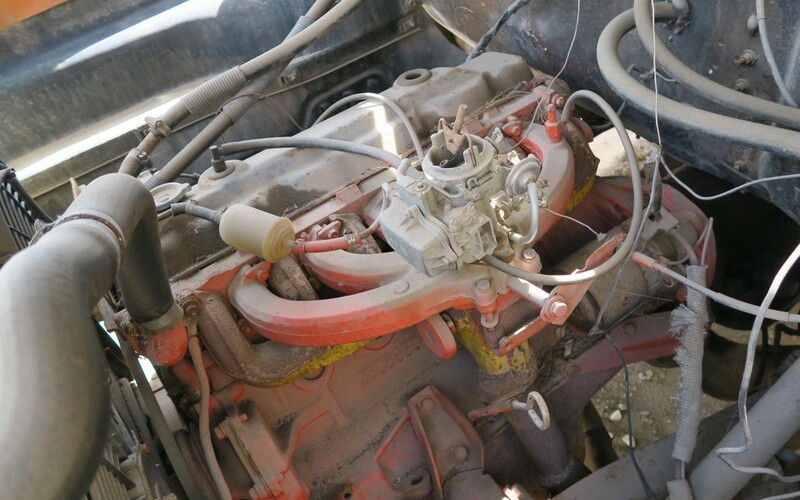 The seller refers to it as a 6-cylinder and unfortunately, it doesn’t run. I don’t see an AC compressor under there but the engine looks pretty tidy, whatever it is. I’m guessing that it may have been rebuilt or at least cleaned up when the truck was restored so hopefully it’ll run again without too much work. 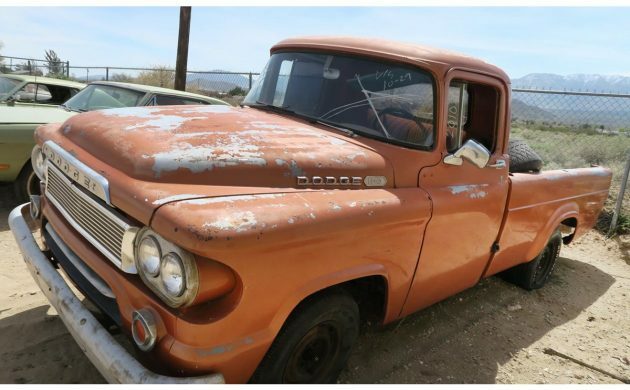 Any clue on the exact year and engine/transmission combo in this truck given the VIN and photos in the listing? A slant six will run run and run forever I would rather have a slant six over the flat head six any day. Thanks, Mark & Zack. I wasn’t sure if anyone knew whether these trucks were supposed to have the 230 flathead-six, which is what I found in my research. I was just wondering if a 1960 Dodge D100 ever came with a slant-six or not. I agree, I’d take one over almost any V8 myself. I’ve had a couple of them and they’re great and super easy to work on. The slant six did not come in 1960 trucks the slant six was made to fit in the 1960 valiant then they used it from then on in almost every car. 225″ Slant was available in the full size 60 Dodge Dart and Plymouth. It was made in two versions from the start to fit compacts and full size Chrysler vehicles. I’ve had a couple slant sixes, ford straight sixes and 1 chevy straight in a nova they all ended up with mega miles on them with very little maintenance!! I could see a modern hemi in this truck though!! It would be a beast!! I have a 1963 Plymouth valiant with a 170 slant six packed with mild performance parts with a stock block and a 4-barrel. It is know record setter but it gets the job done and it does a very aggressive one wheel peel it gets fairly good gas mileage and I drive it every day with very few problems. You want info on anything Mopar, go to Allpar, they are the best. Apparently, only 2 engines were available in 1960, the 230, 120hp flathead 6, that had been around since WW2, or the 318 V8. Oddly enough, the 6 outsold the V8 3 to 1. I thought these were the nicest Dodge trucks, and styling went downhill from here, and I’m not the only one that thought so, Dodge never sold as many trucks as Ford or GM, until recently, and they don’t even call them Dodges anymore,,,for shame, ditching their roots like that. Also, I read, trucks didn’t get an alternator until ’61. With an aftermarket A/C inside and nothing on the motor, I’d bet this had a V8 originally. A/C on a flathead 6 would be suicide. 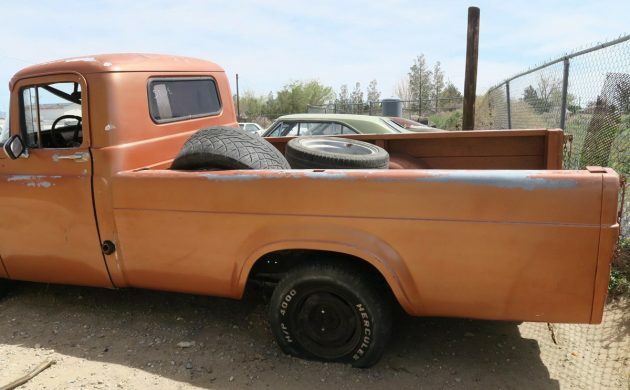 Cool truck, priced way low for California,,and judging by the lack of bidding, even at $2,500, which I consider a good deal for this, nobody wants it. And if nobody wants a truck this unique, for this price, sumting wrong. Could you please knock off the California cracks. It is really getting old, and as a second generation Californian, I’d appreciate it if you kept such comments to yourself. As I type this, the rule below this box states ” . . . no politics or personal attacks.” ‘Nuff said. Is “Cool truck, priced way low for California,” a “crack”? The way I read it the comment refers to the premium that CA vintage vehicles often bring due to their state of preservation from the states mild climate. Perhaps even a left handed compliment that could have just been worded better. jmo. Agreed Howard. 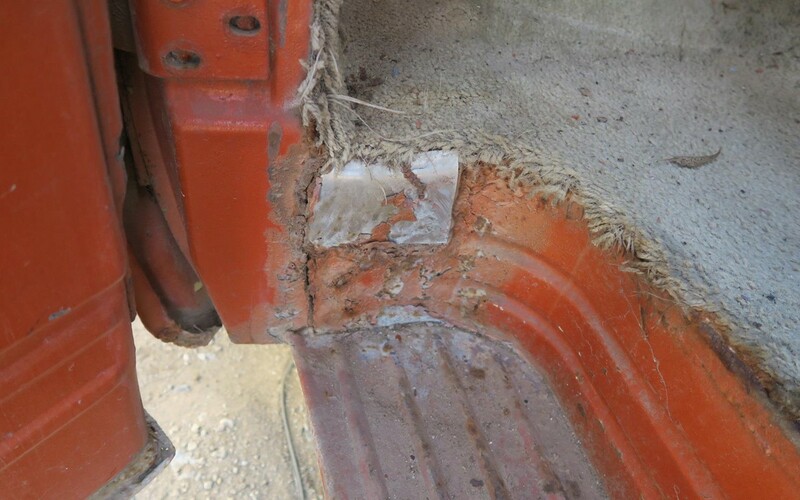 This truck might be able to be purchased in the $1500-$1800 range and if that aint cheap enough for an old truck in this condition, then there definitely is something wrong. Sheesh you could haul lumber in for that price. These trucks had really soft door latches that wore out quickly. Note the screen door sliding lock on the driver door. And with such a big radiator why the dual electric fans? Slant 6 AC brackets are fairly scarce so did they run the AC compressor off the fan pulley? Seem’s like some high school kid would be tickled and enthused to have this truck and its affordable enough for one. 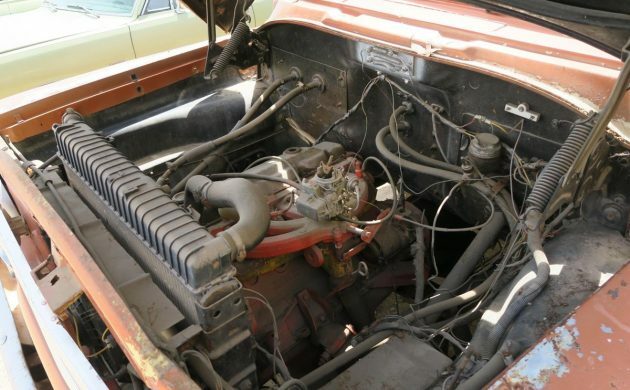 I have an aftermarket [now period] AC on my 63 Valiant which has been there for likely 45 years at least. The compressor runs from the fan pulley. The brace used looks like a universal piece adapted to purpose or that came with the installation kit. I had one of these trucks, albeit a 58, for 43 years. Best work truck ever. Yes, the door locks were a major problem. I never passed an “old” wrecking yard without looking for them. There is a guy, now, who rebuilds them, but it is pricey. First off there’s no way the seat is original. That fabric came along in latter years. Second there’s no way that shifter is factory either if it was a factory automatic. It would be on the colounm. I’d be inclined to go with the vin information of v8 4 speed. As for working on them they were a bear to do a tuneup on. Anyone who’s changed a set of points will agree. As far as I know from reading a lot of Mopar info the transition year from flat head to leaning tower of power was 59/60 at least for cars. The power wagon held on to the flatty until 1972. After that the flatties were found in industrial applications up to as late as 2002. The only thing I’d change is finding another 4 speed for it. The interior needs work a fresh coat of paint is needed I’d go with red. The front of these trucks looked good with that headlight treatment. The back looks like crap with the round taillights flat corners and step side tailgate. I think this truck is a bargain and if I was in the market for a truck this would be a good one to pull the trigger on. Nice find. this dodge boy thinks the thing to do here is find a dakota with a 5.2 or 5.9 v8 2 wheel drive and take the whole body off it and put this body and box on the dakota frame and go truckin’! This is an extra long box 8.5 foot D100. By the tag it originally came with a 4 speed Chrysler ‘New Process’ transmission and had a 3.50 rear axle ratio. The way it sits today, it has a new style slant 6 and an automatic, with a Mid-60’s Mustang shifter and gated deco where the 4 speed would have come thru on the floor. It is also missing the rear bumper and tailgate which are tough finds today. The cab is a ‘base’ small rear window model, and appears to have originally come in the same color as a nearly identical ’59 I own: Klondike Yellow. The seat is non o.e. and appears to be a junk yard find as the fabric and seating was totally different from Dodge. I believe the fabric and vinyl was called ‘Saran’ in their literature. Right hand headlight nacelle appears off an A or B series IH from same era…. it should look like the one on the left. My ’59 has the 230 flathead six and 3 speed manual floor shift; rear gears are 4:10. Top speed on the highway is a struggle at 55mph. These boxes were also sold to Studebaker for use on their pickups when Dodge went to the new style Dart Pickup in ’61 with slant six. Full size Studebaker or Dodge, the box fit the styling like a saddle on a sow…..
First thing to go would be those stupid side mirrors. They have no reason being on a truck like this. Love the color and, especially, the dash design. Hanging AC would be a cool thing to restore with modern Vintage Air components. Nice find! You need to be a Mopar nut, masochist or highscool kid that practically got it for nothing.